We have all heard time and again that stretching is a great way to reduce the risk of injury as well as aid in recovery from a work out. So why is it that we still get injuries and our bodies feel sluggish, even when we stretch? The broad answer is “it depends”, but if indeed you are stretching before and after your workouts, you may be in a stretch trench. I came up with term many years ago when I would watch my dedicated patients stretching, routinely, at the gym, yet they would still get cramps, heavy legs and even some restless night’s sleep. The problem is that many of us who do take the time to stretch are often culprits of stretching to feel good. Meaning we are doing stretches that we not only think are helping, but they also feel so good to do them. Great! No, not really. These are the stretches that are likely the LEAST needed to help you receive the benefits of stretching. Confused? Don’t be. What I’m saying is that your act of stretching may be on point, but your angle of stretching may not be. Those who stretch frequently, can enjoy the feeling of a stretch so much that they fail to hit the parts of a muscle that would actually benefit from a stretch. These are the spots that are likely to cramp up, feel a twinge, etc. Perhaps it’s better to give you an example to better demonstrate this point. Many people do the common stretch of standing with one leg extended, a foot placed on a chair or step and bending forward at the waist towards the toes of the outstretched leg. Great hamstring stretch? Sure. However, if you can easily get into this position, you are likely only stretching a one healthy part of your three hamstring muscles (semi-membrinoseous, semi-tendnoseous and biceps femoris). 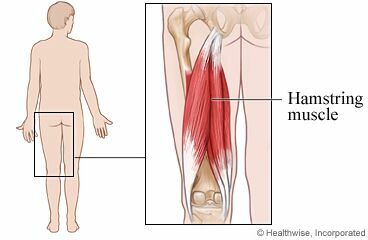 More importantly, you are likely not stretching the muscle also known as the fourth hamstring, the adductor magnus. Typically considering to be a groin muscle, many fail to address this beefy muscle and when injuries occur, it is the adductor magnus that is the villain. For starters, instead of bending forward at the waist, straight over your feet, rotate your extended foot inward or outward and then bend over towards that sides foot. You will immediately feel the stretch hit other aspects of the hamstrings that are not being targeted as well. Another variation would be to place one foot on a chair and bend over at the waist to try and touch the foot of your standing leg. You will immediately feel a much different stretch to your hammy’s. You can even do some other variations where you turn the foot of your straight leg in or out or you may rotate your torso, so your midline is to the outside of your leg or inside. Varying the angles of your line of stretch will incorporate many underappreciated and seldomly addressed aspects of muscles. Many of us also aim to feel a stretch in the belly (middle) of a muscle. However, research has shown that most injuries to muscles occur at the musculo-tendonus junction, the area where the muscle blends into the tendon which attaches the muscle to the bone. So, the next time you stretch, change the angle of your line of stretch to an angle that seems more restrictive. You will be hitting the areas of the muscles that really need your attention. As always, ask your therapists for recommendations for better stretching too!